So we are planning to support HyuN to play and cast! here is match up ! I love you, Golden. I will help save Hyun. 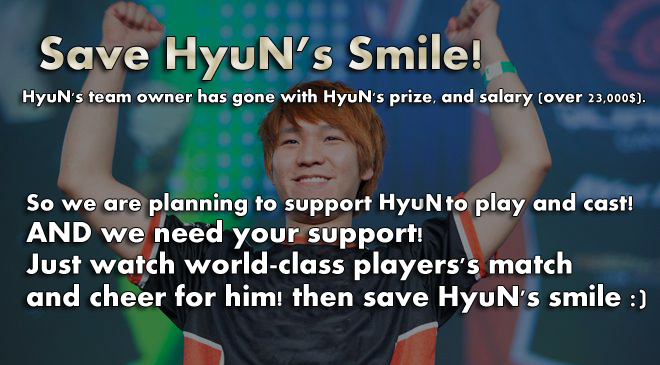 Wow this seems like quite a sincere and appreciatively nice thing to do, even though it may not fully cover the owed money, I hope it encourages Hyun to stay as a pro gamer. What a Good Guy Golden! I really like what you're doing for Esports (and especially Hyun). First the APM league and now this, good job Golden! hi golden, i've added this to the calendar, let me know if the event is ok! awesome move by the players and Golden. i will tune in and support HyuN! Wow, Golden seems like the nicest guy! Will watch!